Mike Ullery | Daily Call Lehman Catholic’s Elliott Gilardi looks to avoid a tackle against Fort Loramie Saturday at Alexander Stadium/Purk Field. Mike Ullery | Daily Call Lehman Catholic’s Drew Barhorst (12) and Brendan O’Leary (25) attempt to break up a pass Saturday night. Fort Loramie already had four solid options when it wanted to use a running play on offense. The Redskins found a fifth in a Division VII, Region 28 semifinal win over Lehman Catholic on Saturday at Alexander Stadium in Piqua. And if they want to win their first regional title next week, they made need all five. Fort Loramie built a three-touchdown lead by halftime and added two more in the first 15 minutes of the second half to run away to a 35-0 victory over the Cavaliers. The Redskins (11-1) advance to their second regional final in program history and will face Convoy Crestview at 7 p.m. Saturday at Lima Spartan Stadium. Crestview (11-1) shut down Minster’s offensive attack in the second half of Region 28’s other semifinal to win 28-14. Fort Loramie’s only loss came by 20 points in Week 1 to Minster. It’s Fort Loramie’s first regional final berth since 2009 and only the second since the program started in 2005. The Redskins lost to Marion Local in a Div. VI regional final in 2009. A victory would add to an already historical season. Fort Loramie surpassed 3,000 team rushing yards for the season on Saturday — the second-most it has amassed in program history, behind only the 2009 squad. The squad also has the second-most passing yards in program history, behind only the 2013 team. The stout rushing attack has been led by senior Carter Mescher, junior Nick Brandewie, sophomore Collin Moore and sophomore Max Hoying, who all have over 500 rushing yards and seven rushing TDs for the season. Senior Devin Wehrman ranked sixth on the team in carries (37) and fifth in yards (256) entering Saturday’s game but was a main rusher against the Cavaliers. He scored on an 11-yard run and a 5-yard run in the second half and also had a couple of big runs in the first half. The Cavaliers finish the season 8-4. They dropped to 4-3 with a loss to Waynesfield-Goshen in Week 7, and their playoff and Northwest Central Conference hopes looked bleak at that point. But they rebounded and won their last three regular-season games and a playoff opener last week. Their rebound came with as little as 20 healthy players available. Lehman dressed 23 players on Saturday. 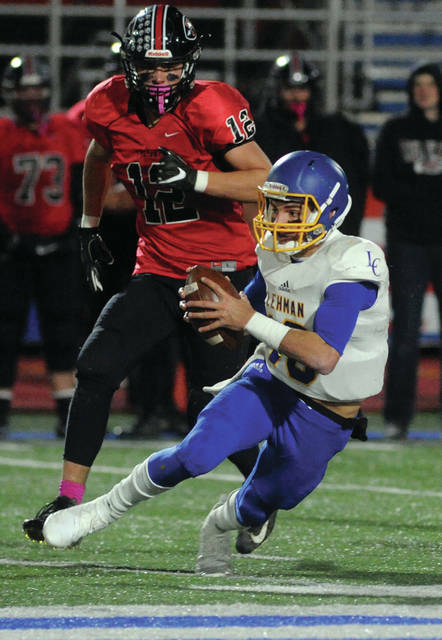 Lehman will lose 10 seniors to graduation, including senior quarterback Elliott Gilardi, who is a three-year starter and was named the Northwest Central Conference offensive player of the year. They’ll also lose first-team NWCC selections in kicker Michael Denning, receiver Bradly Haynes, lineman Logan Bunker and lineman Ethan Knapke. “The rest of our guys, I can’t say enough about them. They just came out and worked hard,” Roll said. “We had kids move positions like Mitchell Sollmann. He was running back for three years and moved to the line for us. Jared Magoteaux did the same for us before he got hurt. Gilardi had a couple of big throws and runs against Fort Loramie but was largely contained. The Cavaliers drove into the red zone twice in the game. They punted on one red zone drive and had a field goal blocked on the other. Out of all Fort Loramie’s good athletes, Wehrman had the biggest second half. Fort Loramie led 21-0 at halftime, and Lehman turned the ball over on downs near midfield on the first drive of the second half. Moore, a sophomore quarterback, threw a 51-yard pass to Mason Kemper on third down, then Wehrman ran 11 yards for a touchdown on the next play to push the lead to four touchdowns with 9:11 left. Denning had a 40-yard field goal try blocked by the Redskins later in the third. 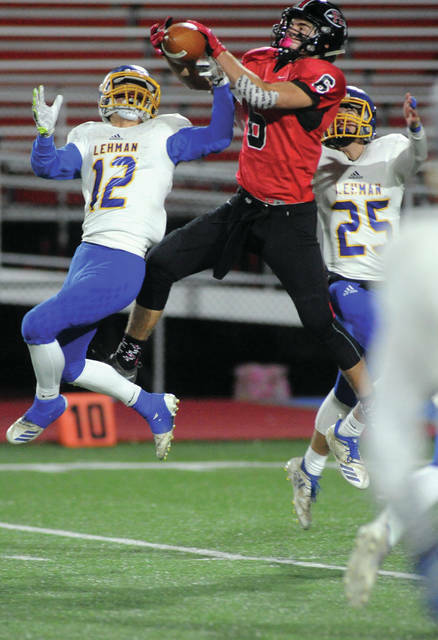 Fort Loramie later turned the ball over on downs, but Jake Ratermann ended Lehman’s next drive by intercepting a pass from Gilardi at Lehman’s 28. Wehrman scored on a 5-yard touchdown run with 9:41 left in the fourth to boost the lead to 35-0 and start a running clock. Though Lehman was able to get some big offensive plays a few times, Wells was happy the team was able to bounce back soon after. Carter Mescher returned the opening kickoff of the first half 51 yards, but Fort Loramie was forced to punt after gaining one first down. Lehman Catholic’s first drive ended when Gilardi had a pass intercepted at Fort Loramie’s 27 by Nick Brandewie. After the interception, the Redskins drove into the red zone after a couple of big runs by Moore and Brandewie. Moore capped off the drive with a 4-yard touchdown run with 2:02 left in the first quarter to put Fort Loramie ahead 7-0 after an extra point by Beltran Lafarga. Lehman was forced to punt after losing yards on its next drive, and Fort Loramie quickly scored. Kemper caught a pass along the left hash marks and dodged a couple of defenders to score on a 27-yard pass from Moore with 10:46 left in the second. The Cavaliers drove into Fort Loramie territory on their next drive but were forced to punt. Denning pinned the Redskins on their 5. After driving to midfield, a penalty pinned Fort Loramie back on its own 30. A 16-yard pass from Moore to Mark Seger and a 24-yard run by Moore helped move it into the red zone, then Moore scored on a 1-yard run with 1:30 left to increase the lead to 21-0. The victory is the seventh consecutive for the Redskins by a margin of 35 points or more. https://www.dailycall.com/wp-content/uploads/sites/30/2018/11/web1_111018mju_fb_lhs_10.jpgMike Ullery | Daily Call Lehman Catholic’s Elliott Gilardi looks to avoid a tackle against Fort Loramie Saturday at Alexander Stadium/Purk Field. https://www.dailycall.com/wp-content/uploads/sites/30/2018/11/web1_111018mju_fb_lhs_12_25.jpgMike Ullery | Daily Call Lehman Catholic’s Drew Barhorst (12) and Brendan O’Leary (25) attempt to break up a pass Saturday night.